The next day, we had to go back for the suit fitting at noon, so we decided to stay on the Kowloon side of Hong Kong and kill some time by visiting some of the markets. 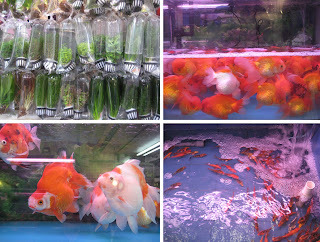 We started off at the goldfish market. This was a street full of goldfish shops, just selling goldfish. Oh, and the odd one selling hamsters and rabbits..... We never figured out why there were so many goldfish shops and why there was such a big market for them, but deduced that because people live in such small places that it's the only pet that would fit!